What is “Urban Lumber” and Why is it Important? “Urban Lumber” is wood that has been harvested from residences, businesses, city parks, and areas being cleared for development. Most of these trees are chipped for mulch or buried in a landfill. The magnitude of this “waste” is staggering. According to the U.S. Forest Service, five billion board feet of usable lumber—about 1/3 of all hardwood lumber harvested in the U.S.—was cut from urban areas. Nearly all of it was cut for firewood, chipped for mulch, or buried in a landfill. At $.25 per board foot, that comes to $1.25 billion! The value doubles to $2.5 billion, after the logs are sawn into boards. Harvesting and milling urban lumber represents some interesting opportunities and challenges for the landowner, harvester, and sawyer. The trees tend to be mixed species, most of which are not harvested on a commercial basis. Grown for shade, rather than lumber, they tend to be large diameter, but branch out too low to the ground to produce a usable saw log. Harvesting around structures must be done by a bonded and insured tree care service crew, and removing the logs without damaging lawns requires time and equipment most loggers do not have. Even if a suitable-size log is removed from a yard, most commercial sawmills will not accept it because of the high probability of metal—nails, steel cable, even fence posts—can destroy a $12,000 saw blade in the blink of an eye. In spite of all that, for some small sawmill operations, the opportunities far outweigh the challenges. First of all, you only should only take logs that have already been put on the ground, so you do not take the risk of destroying structures. The diversity of species gives people a niche for woodworkers. Honey locust, mulberry, sassafras, catalpa, sycamore, elm, and tulip poplar bring a premium from woodworkers who want to create a unique project. The same is true for the form of the tree. Large wide slabs for table tops and counter tops are always in demand, but commercial sawmills focused on one or two products will not cut them. 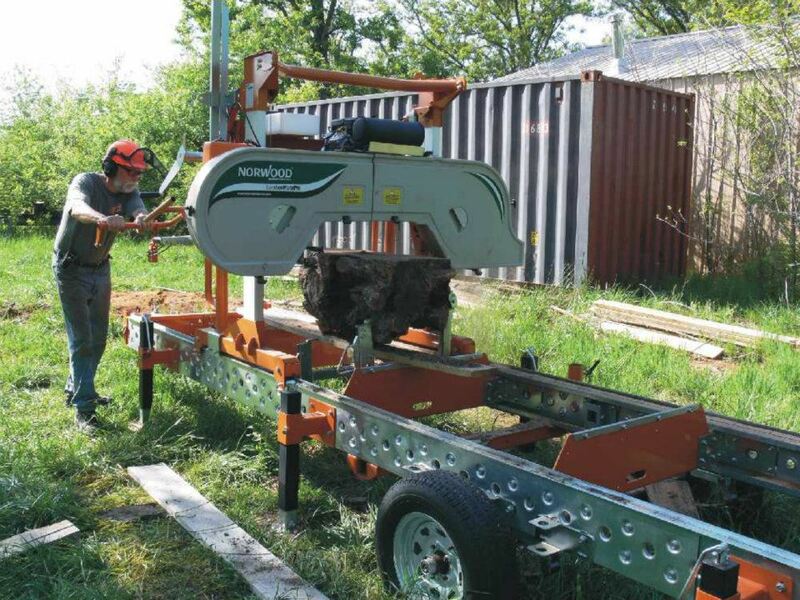 The ideal sawmill for urban lumber needs to be flexible enough to mill a 4’ long, 30” diameter walnut stump, as well as a 12’ long 10” diameter honey locust. It should be able to cut wide slabs or dimension lumber, portable enough to bring right into an urban area to mill on-site and the blades should be inexpensive enough to be replaced when they strike metal. 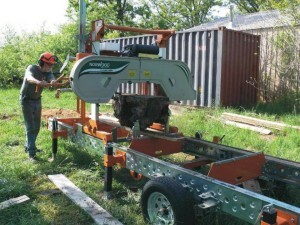 A portable bandsaw mill is ideal. While we are strongly in favor of using urban trees, it is important to give landowners a realistic idea of what to expect.